Dramatic footage of a possible UFO crash has been reported in Russia. The unknown luminous object came down in a forest near the town of Privetnoye in the Omsk region of Russia. 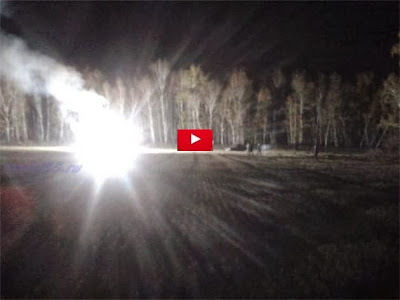 According to several Russian news agencies, many witness's observed the luminous object falling in the forest near Privetnoye, before a huge fire occurred. Locals tried to put out the fire, but say that even foam could not quell the intense flames. "The object was dazzling, it fell slowly, and then there was a huge intense fire"
Firefighters and local officials who inspected the scene, concluded it was nothing more than a pile of garbage, and a prank, but witness's to the event are not convinced, and mention discovering strange white crystals at the site of the crash. Could the object be a UFO or possibly a Meteor, further reports are pending. Watch the eye witness reports below. Aliens Control The United States Government?